TRANSFORMED HIS HEALTH AND CAREER. to the percussive BEEP of a checkout scanner. the first of its kind in his hometown of Lynchburg, Virginia. Some might call this picky — metropolitan food snobbery in a small city — but Dave and his wife, Connie’s reasoning for eating clean (ethically treated meat, organic/non-GMO plans, no dairy) doesn’t derive from passing fads or trendy trigger words. the entrepreneur he is today. In short, changing his eating habits transformed his life. “The passion that got me into this is that I wanted to share the transformation I had in my own health, and to see other people do the same,” Dave said. Finish high school. Start a career. Get married. Buy a house. Stick with the same company for decades and shift ever upwards. Keep your head down, put your nose to the grindstone and your hand to the plow. It’s the narrative we are all pitched as the way to “make it” and have financial stability. Dave began working for a Lynchburg-based printing company in lieu of going to college. At first, he enjoyed the dynamics of the industry — the chemistry involved, operating large printing presses, creating a tangible product, engaging his mind — but the overall intent of the work, however (which sometimes amounted to printing and “just mailing junk to people”) was unfulfilling. But he didn’t believe he could quit. He had married young, divorced, and needed to pay off his mortgage. Youthful ambition inspired him to work as many positions in the company as he could, and so he hopped from one department to another through the near two decades he spent with the company. As time went on, he could not ignore how unhappy it made him to spend 40+ hours of every week doing work that did not fulfill him. “I just kept moving up and challenging myself. I just stayed there,” he said, but the allure of corporate climbing had long since lost its luster. He wanted more from his career. Incidentally, he also wanted more for his life. His health was faltering from what he later learned had to do with what he was eating. He dealt with issues he didn’t know until later were food allergies. While using conventional medicines, the issues continued to resurface. He felt like he was living in an endless cycle of antibiotics and other pharmaceuticals that seemed only to mask the symptoms, and not actually heal him. Among the ailments he experienced: seasonal allergies, asthma, and, later on, depression and digestive issues such as heartburn. He regularly got sinus infections and took nasal steroids. His mother suffered from similar issues, and later died as a result of their not being addressed early or thoroughly enough. That was the “eye-opener.” He couldn’t continue down the same path his mother went. Something had to change. Dave's own path diverged from his mother’s while vacationing in Emerald Island, North Carolina, near the end of his time at the printing company. He stood on the beach, frustrated: “I was at the end of my rope with health issues and not getting relief from conventional medicine. And I was at the same place with my job, just kind of at a dead end. Just unfulfilled and really knew that I wanted more. “I had prayed a lot about specific things, being a Christian. It was an ongoing process of praying and praying that God would lead me especially out of the health crisis I was in and to find a more fulfilling career." Unable to enjoy the beach one evening because of a storm, he decided to explore the town. He stumbled upon a health food store operated by a woman who (like Dave) had been introduced to natural healing while wanting a more fulfilling career and relief from health problems. She later decided to go to school to become certified as a natural health consultant, later opening her own shop. Having heard her story, he left that day inspired. He wanted to pursue natural healing in a deeper way than just flipping through books, and so he started to research online programs, eventually becoming certified as a natural health consultant. Soon, the puzzle pieces that eventually became Health Nut Nutrition and, later, Millie’s Living Cafe, came together — seemingly of their own accord. His Sunday School teacher at the time, a bank manager, shared insights with him on how he could finance the opening of Health Nut. Following his advice, Dave took out a second mortgage, got a home equity line of credit and funded the business. “So from there, it hasn’t been an easy road. By no means. I’ve been on my knees before God a lot. Especially in the first 6 years of business. When you go out on your own, you don’t have health insurance, you don’t have vacation days, you don’t have a lot of things that were supporting you. It was just tough, tough financially — tough spending days at the store with nobody coming in, and staring at walls and walls of inventory,” Dave said. He said it was his faith in God that held him together during this time. He figured that if opening a health food store in Lynchburg, Virginia, was his calling, then the opportunities would continue to unfold. If it wasn’t his calling, the store would fold. Making the transition from dissatisfied employee to passion-fueled entrepreneur as Dave did is uncomfortable. The human mind tends to recoil from the unknown, preferring to stick to the tried and familiar — even when it no longer serves you. But once you push through to a new level of experience, sticking to it becomes part of who you are. The new system begins to sustain itself, like an ongoing self-fulfilling prophecy. Changing your diet and lifestyle is no different. You can make that change with intention; you can make the effort to research how to live a healthier, more fulfilled life and take action based on your findings. In essence, you “get sick and tired of being sick and tired,” and decide to do something about it. One Health Nut customer that Dave helped, for example, had been dealing with a chronic issue with drainage around her eye and nose. She visited a list of specialists who prescribed various treatments to dry up the problem. In the end, a “pretty extreme” surgery was recommended. Previously, Dave had given her an olive leaf extract nasal spray, which has been shown to work as an anti-fungal. When she informed him that she was going to have surgery done, he asked her if she had been using the spray. She said she had been, but only about once per day. In the end, it wound up working for her. The problem cleared and she avoided an operation. His staff have helped people with ailments such as cancer, skin issues, fungal infections, heartburn and all sorts of other problems that normally prompt people to use synthetic drugs that moderate symptoms but don’t actually address the root cause. Dave’s mother was one such individual who tried to find relief through conventional medicine to combat her chronic asthma. As a complication of those problems, she developed pneumonia. “It was pretty horrific. She had to have a tracheotomy put in her esophagus, just to breath. She pretty much had her own machine,” he said. “At that age (she was in her 80s), it’s a lot harder to overcome things. But it can be done,” he said. “They were going to have to move her to Roanoke to special nursing home that health specifically with people with tracheotomies. Once she found that out, she pretty much gave up. “She wouldn’t try things. She would take a multivitamin, and that’s about it. For my mother to overcome what she had to overcome at the age she had she would have had to extremely transform her diet and then taken supplements,” he said. If you are struggling with your health or simply want to further improve an already balanced lifestyle but don’t want to make any changes, then no changes will be made. After his mother passed away in 2012, Dave became even more inspired in his new path, leading him to open Lynchburg’s only vegan restaurant and naming it “Millie’s” in her honor. When it comes to your own nutrition, Dave recommends looking into your preconceived notions of what you think is healthy or permissible to consume. Think about the messaging you receive. Is one industry attempting to vilify another for profit? What’s the science behind it? Who funded the study? Can you find any counter evidence? osteoporosis in the world,” he said. “In Japan, I don’t think they even have a word for osteoporosis, and they don’t drink milk like we do,” he said. “It isn’t until probably the last century that people are starting to wake up,” he said. “Now we know that we need good fat; we need it in our diets. We should stay away from fat-free milk and fat-free butter, because they’re processed it and chemicalized it to where it’s supposed to be good for you. “And the whole sweetener industry with sucralose and aspartame and all these fake sugars that are supposed to be better for you. In actuality, they make you more addicted to the sugar,” he said. Dave’s advice: Watch documentaries. Inform yourself. Change your life for the better. He believes that a lot of eating healthy and shopping consciously becomes common sense when you think about it. The word “organic,” for example, leads some people to believe that something special has been added to the food or the growing process, when really, it’s simply genetically unmodified produce that comes out of the ground without chemicals being sprayed on it. “I kind of see us as the future, all-natural drugstore,” he said. Instead of going to the typical drugstore to get conventional medicine that just masks symptoms of greater, underlying issues, you can come to Health Nut and get the real thing. Those consultants, he said, are one of the key reasons why the business has been so successful. Currently, Health Nut has reached “maximum capacity” at what is now its third location. He has been to other natural health stores in the past where he felt like he could spend 30 minutes or more walking around without ever being acknowledged by an associate. He knew he did not want his store to run that way, and so he emphasizes being personable and “going the extra mile” to make sure customers get the help they need. As a result, he said that even the sales reps from the various companies they stock regard Health Nut’s team as “hands down” the best staff of any health food store they work with in terms of the level of passion and expertise his staff brings to the floor. “I hear it all a time, and it means a lot, and I attribute that to God, again. I’m not a savvy interviewer that can interview the right person and get them in here. I’ve just been lucky to get the right people. God’s been putting them in my path,” he said. “We have best products the natural health industry has to offer, and the staff that puts it all together and really helps people." 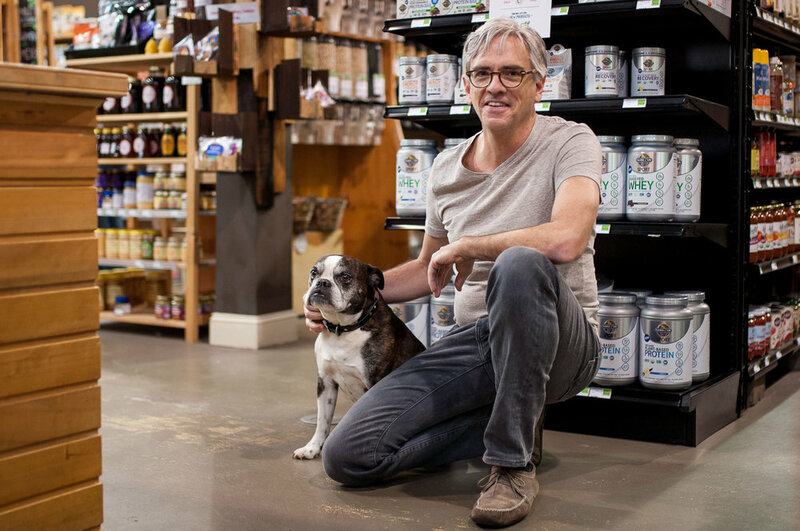 Whether it is for the store or the cafe, the products come from local producers, preferably, and the items he cannot find in the area, he obtains from Albert’s Organics and United Natural Foods. Although Dave does not consider himself an expert interviewer, he is particular when it comes to what items end up on the shelf. “We’ve gotten to visit a lot of the farms that we deal with. We haven’t gone to all of them yet, but when a local company does come in, we know the right question to ask to know if they are practicing the right way,” he said. When an egg farmer came to visit them a couple of years ago, he asked if they fed their chickens GMO grain, and the farmer seemed like he never heard the term before. “Whoop, STRIKE! We’re not working with you. You can talk to somebody long enough to know what their commitment is and what they’re doing. [...] It’s a big commitment for me and for the future of the store to continue to grow those relationships with our local producers. One such producer is Mountain Run Farm, of Sedalia. Dave, who is on a first-name basis with the owner and has carried their products for years, praised them for being on the cutting edge of sustainable beef production. He enjoys getting to support them in a way that allows both parties to grow. “It’s been really cool,” he said. Concerning the growth of both Health Nut and Millie’s, Dave doesn’t have any elaborate plans other than getting more involved with the needs of the local community, continuing to grow slowly and sustainably, perhaps moving to a larger location if and when the opportunity becomes available. He dreams that one day his wife Connie will be able to leave her job and join him either as a nutrition coach/counselor, or on the business side (which he says he could use a lot of help with). To learn more about health nut nutrition, visit the About Us page.